CRS R44716 - Conventional Arms Transfers to Developing Nations, 2008-2015. This report provides Congress with official, unclassified, quantitative data on conventional arms transfers to developing nations by the United States and foreign countries for the preceding eight calendar years for use in its policy oversight functions. All agreement and delivery data in this report for the United States are government-to-government Foreign Military Sales (FMS) transactions. Similar data are provided on worldwide conventional arms transfers by all government suppliers, but the principal focus is the level of arms transfers by major weapons supplying governments to nations in the developing world. Developing nations continue to be the primary focus of foreign arms sales activity by weapons suppliers. During the years 2008-2011, the value of arms transfer agreements with developing nations comprised 80.39% of all such agreements worldwide. More recently, arms transfer agreements with developing nations constituted 80.92% of all such agreements globally from 2012-2015, and 81.70% of these agreements in 2015. The value of all arms transfer agreements with developing nations in 2015 was $65.2 billion. In 2015, the value of all arms deliveries to developing nations was $33.6 billion. Recently, from 2012 to 2015, the United States and Russia were predominant the arms market in the developing world, with both nations either ranking first or second in all but the most recent in these four years in the value of arms transfer agreements. From 2012 to 2015, the United States made nearly $86 billion in such agreements, 33.38%of all these agreements (expressed in current dollars). Russia made $48.6 billion, 18.94% of these agreements. During this same period, collectively, the United States and Russia made 52% of all arms transfer agreements with developing nations, ($134 billion in current dollars). In 2015, the United States ranked first in arms transfer agreements with developing nations with $26.7 billion or 41% of these agreements. In second place was France with $15.2 billion or 23.30% of such agreements. In 2015, the United States ranked first in the value of arms deliveries to developing nations at $11.9 billion, or 35.42% of all such deliveries. Russia and France tied for second in these deliveries at $6.2 billion each and each representing 18.45%. In worldwide arms transfer agreements in 2015–to both developed and developing nations–the United States was predominant, ranking first with $40.2 billion in such agreements or 50.29% of all such agreements. France ranked second in worldwide arms transfer agreements in 2015 with $15.3 billion in such global agreements or 19.16%. The value of all arms transfer agreements worldwide in 2015 was $79.9 billion. In 2015, Qatar ranked first among all developing nations weapons purchasers concluding $17.5 billion in the value of arms transfer agreements. Egypt ranked second, concluding $11.9 billion in such agreements. Saudi Arabia ranked third with $8.6 billion in such agreements. This report provides Congress with official, unclassified data from U.S. government sources on transfers of conventional arms to developing nations by major suppliers for the period 2008 through 2015. It also includes some data on worldwide supplier transactions. It updates and revises CRS Report R42017, Conventional Arms Transfers to Developing Nations, 2007-2014, by Catherine A. Theohary. Data in this report provide a means for Congress to identify existing supplier-purchaser relationships in conventional weapons acquisitions. Use of these data can assist Congress in its oversight role of assessing how the current nature of the international weapons trade might affect U.S. national interests. For most of recent American history, maintaining regional stability and ensuring the security of U.S. allies and friendly nations throughout the world have been important elements of U.S. foreign and national security policy. Knowing the extent to which foreign government arms suppliers are transferring arms to individual nations or regions provides Congress with a context for evaluating policy questions it may confront. Such policy questions may include, for example, whether to support specific U.S. arms sales to given countries or regions or to support or offset arms transfers by other nations. The data in this report may also assist Congress in evaluating whether multilateral arms control arrangements or other U.S. foreign policy initiatives are being supported or undermined by the actions of arms suppliers. This report focuses principally on the level of arms transfers by major weapons suppliers to nations in the developing world–where most analysts agree that the potential for the outbreak of regional military conflicts currently is greatest, and where the greatest proportion of the conventional arms trade is conducted. For decades, during the height of the Cold War, providing conventional weapons to friendly states was an instrument of foreign policy utilized by the United States and its allies. This was equally true for the Soviet Union and its allies. The underlying rationale given for U.S. arms transfer policy then was to help ensure that friendly states were not placed at risk through a military disadvantage created by arms transfers by the Soviet Union or its allies. Following the Cold War's end, U.S. arms transfer policy has been based on maintaining or augmenting friendly and allied nations' ability to deal with regional security threats and concerns. Data in this report illustrate global patterns of conventional arms transfers that have changed in the post-Cold War and post-Persian Gulf War years. Relationships between arms suppliers and recipients continue to evolve in response to changing political, military, and economic circumstances. Whereas the principal motivation for arms sales by key foreign suppliers in earlier years might have been to support a foreign policy objective, today that motivation may be based as much, if not more, on economic considerations as those of foreign or national security policy. Nations in the developing world continue to be the primary focus of foreign arms sales activity by conventional weapons suppliers. During the period of this report, 2008-2015, conventional arms transfer agreements (which represent orders for future delivery) to developing nations comprised 80.24% of the value of all international arms transfer agreements. The portion of agreements with developing countries constituted 80.92% of all agreements globally from 2012-2015. In 2015, arms transfer agreements with developing countries accounted for 81.7% of the value of all such agreements globally. Deliveries of conventional arms to developing nations, from 2012 to 2015 constituted 67.89% of all international arms deliveries. In 2015, arms deliveries to developing nations constituted 72.69% of the value of all such arms deliveries worldwide. The data in this new report supersede all data published in previous editions. Because these new data for 2008-2015 reflect potentially significant updates to and revisions of the underlying U.S. government databases used for this report, only the data in this most recent edition should be used for comparison of data found in previous reports. The data are expressed in U.S. dollars for the calendar years indicated, and adjusted for inflation (see box note below). U.S. commercially licensed arms export deliveries values are excluded (see box note on page 16). Also excluded are arms transfers by any supplier to subnational groups. The definition of developing nations, as used in this report, and the specific classes of items included in its values totals are found in box notes below. The report's table of contents provides a detailed listing and description of the various data tables to guide the reader to specific items of interest. All arms transfer and arms delivery data in this report are for the calendar year or calendar year period given. This applies to U.S. and foreign data alike. United States government departments and agencies publish data on U.S. arms transfers and deliveries but generally use the United States fiscal year as the computational time period for these data. As a consequence, there are likely to be distinct differences noted in those published totals using a fiscal year basis and those provided in this report which use a calendar year basis. Details on data used are outlined in notes at the bottom of Tables 3, 14, 30 and 35. The values of arms transfer agreements (or deliveries) in this report refer to the total values of conventional arms orders (or deliveries as the case may be), which include all categories of weapons and ammunition, military spare parts, military construction, military assistance and training programs, and all associated services. As used in this report, the developing nations category includes all countries except the United States, Russia, European nations, Canada, Japan, Australia, and New Zealand. A listing of countries located in the regions defined for the purpose of this analysis–Asia, Near East, Latin America, and Africa–is provided at the end of the report. Throughout this report values of arms transfer agreements and values of arms deliveries for all suppliers are expressed in U.S. dollars. Values for any given year generally reflect the exchange rates that prevailed during that specific calendar year. This report, in places, converts these dollar amounts (current dollars) into constant 2015 U.S. dollars. Although this helps to eliminate the distorting effects of inflation to permit a more accurate comparison of various dollar levels over time, the effects of fluctuating exchange rates are not neutralized. The deflators used for the constant dollar calculations in this report are those provided by the U.S. Department of Defense and are set out at the bottom of Tables 4, 15, 31, and 36, where all data are expressed in constant 2015 U.S. dollars. In places in the text and in figures where constant dollars are not used they are so labeled. For example, all regional data tables that are composed of four-year aggregate dollar totals (2008-2011 and 2012-2015) or when single years are used they are expressed in current dollar terms. Where tables rank leading arms suppliers to developing nations or leading developing nation recipients using four-year aggregate dollar totals, these values are expressed in current dollars. When percentage comparisons are used, they are calculated using current dollars. The value of all arms transfer agreements worldwide (to both developed and developing nations) in 2015 was $79.9 billion. This was a decrease in arms agreements values over the 2014 total of $89 billion. (Figure 1) (Table 1) (Table 30) (Table 31). In 2015, the United States led in arms transfer agreements worldwide, making agreements valued at $40.2 billion (50.29% of all such agreements), up from $36.1 billion in 2014. France ranked second in 2015 with $15.3 billion in agreements (19.16% of these agreements globally), up considerably from $5.7 billion in 2014. The United States and France collectively made agreements in 2015 valued at over $55.4 billion, 69.4% of all international arms transfer agreements made by all suppliers (Figure 1) (Table 30) (Table 31, Table 32, and Table 34). For the period 2012-2015, the total value of all international arms transfer agreements ($317 billion in current dollars) was higher than the worldwide value during 2008-2011 ($266.6 billion in current dollars). During the period 2008-2011, developing world nations accounted for 80.39% of the value of all arms transfer agreements made worldwide. During 2012-2015, developing world nations accounted for 80.92% of all arms transfer agreements made globally. In 2015, developing nations accounted for 81.7% of all arms transfer agreements made worldwide (Figure 1) (Table 30) (Table 31). In 2015, the United States ranked first in the value of all arms deliveries worldwide, making nearly $16.9 billion in such deliveries or 36.62%. This is the eighth year in a row that the United States has led in global arms deliveries. Russia ranked second in worldwide arms deliveries in 2015, making $7.2 billion in such deliveries, and ranked second for all of those eight years. France ranked third in 2015, making $7.0 billion in such deliveries. These three suppliers of arms in 2015 collectively delivered approximately $31.3 billion, or 67.77% of all arms delivered worldwide by all suppliers in that year (Table 2) (Table 36, Table 37, and Table 39). The value of all international arms deliveries in 2015 was nearly $46.2 billion. This is a decrease in the total value of arms deliveries from the previous year from $54.1 billion. The total value of such arms deliveries worldwide in 2012-2015 (about $199 billion) was higher than the deliveries worldwide from 2008 to 2011 (about $187 billion (Table 2) (Table 36 and Table 37) (Figure 7 and Figure 8). Developing nations from 2012 to 2015 received 67.9% of the value of all international arms deliveries. In the earlier period, 2008-2011, developing nations accounted for 57.7% of the value of all arms deliveries worldwide. In 2015, developing nations collectively accounted for 72.7% of the value of all international arms deliveries (Table 2) (Table 15, Table 36, and Table 37). Worldwide weapons orders decreased in 2015. The total of $79.8 billion was a decrease from $89 billion in 2014. The United States' worldwide weapons agreements values increased in value from $36.1 billion in 2014 to $40.2 billion in 2015. The U.S. market share increased greatly as well, from roughly 40.5% in 2014 to 50.3% in 2015. Although the United States retained its position as the leading arms supplying nation in the world, nearly all other major suppliers saw increases too. The principal example was France, whose worldwide agreements increased from $5.7 billion in 2014 to $15.3 billion in 2015. Meanwhile, Russia posted a marginal decline in its global arms agreements values, from $11.2 billion in 2014 to $11.1 billion in 2015. The collective market share of worldwide arms agreements for the four major West European suppliers–France, the United Kingdom, Germany, and Italy–was approximately 22% in 2015. Although the global total in weapons sales in 2015 represents an increase, the international arms market is not likely growing overall. The U.S. global total for arms agreements in 2011 appears as an outlier figure, representing large sales with Saudi Arabia worth approximately $33.4 billion. Moreover, there continue to be significant constraints on its growth, due, in particular, to the weakened state of the global economy. The Eurozone financial crisis and the slow international recovery from the recession of 2008 have generally limited defense purchases of prospective customers. Concerns over their domestic budget problems have led many purchasing nations to defer or limit the purchase of new major weapon systems. Some nations have chosen to limit their purchasing to upgrades of existing systems and to training and support services. Others have decided to emphasize the integration into their force structures of the major weapon systems they had previously purchased. Orders for weapons upgrades and support services can still be rather lucrative, and such sales can provide weapons suppliers with continued revenue, despite the reduction in demand for major weapon systems. As new arms sales have become more difficult to conclude in the face of economic factors, competition among sellers has increased. A number of weapons-exporting nations are focusing not only on the clients with which they have held historic competitive advantages due to well-established military-support relationships, but also on potential new clients in countries and regions where they have not been traditional arms suppliers. As the overall market for weapons has stagnated, arms suppliers have faced the challenge of providing weapons in type and price that can create a competitive edge. To overcome the key obstacle of limited defense budgets in several developing nations, arms suppliers have increasingly utilized flexible financing options, and guarantees of counter-trade, co-production, licensed production, and co-assembly elements in their contracts to secure new orders. Given important limitations on significant growth of arms sales to developing nations–especially those that are less affluent–competition between European nations or consortia on the one hand and the United States on the other is likely to be especially intense where all these suppliers have previously concluded arms agreements with the more affluent states. Recent examples of this competition have been the contests for combat aircraft sales to the oil-rich Persian Gulf states, and a major competition for the sale of a substantial number of combat aircraft to India. The more affluent developing nations have been leveraging their attractiveness as clients by demanding greater cost offsets in their arms contracts, as well as transfer of more advanced technology and provisions for domestic production options. Weapons contracts with more wealthy developing nations in the Near East and Asia appear to be especially significant to European weapons suppliers that have used foreign arms sales contracts as a means to support their own domestic weapons development programs and need them to compensate, wherever possible, for declining arms orders from the rest of the developing world. At the same time, nations in the developed world continue to pursue measures aimed at protecting important elements of their national military industrial bases by limiting arms purchases from other developed nations. This has resulted in several major arms suppliers emphasizing joint production of various weapon systems with other developed nations as an effective way to share the costs of developing new weapons, while preserving productive capacity. Some supplier nations have decided to manufacture items for niche weapons categories where their specialized production capabilities give them important advantages in the international arms marketplace. The strong competition for weapons contracts has also led to consolidation of certain sectors of the domestic defense industries of key weapons-producing nations to enhance their competiveness further. Although less-affluent nations in the developing world may be compelled by financial considerations to limit their weapons purchases, others in the developing world with significant financial assets continue to launch new and costly weapons-procurement programs. Having notable income from oil sales has provided a major advantage for major oil-producing states in funding their arms purchases. At the same time dependency on oil imports has caused difficulties for many oil consuming states, and contributed to their decision to curtail or defer new weapons acquisitions. It's important to note that any possible effects of significant oil declines since the end of 2014 on global arms purchases would not be seen in the period covered by this report. Despite the volatility of the international economy in recent years, some nations in the Near East and Asia regions have resumed or continued large weapons purchases. These purchases have been made by a limited number of developing nations in these two regions. Most recently they have been made by Saudi Arabia and the United Arab Emirates in the Near East–both pivotal partners in the U.S. effort to contain Iran. India in Asia is another large arms purchaser. For certain developing nations in these regions, the strength of their individual economies appears to be a key factor in their decisions to proceed with major arms purchases. A few developing nations in Latin America, and, to a much lesser extent, in Africa, have sought to modernize key sectors of their military forces. In recent years, some nations in these regions have placed large arms orders, by regional standards, to advance that goal. Many countries within these regions are significantly constrained by their financial resources and thus limited in the weapons they can purchase. Given the limited availability of seller-supplied credit and financing for weapons purchases, and their smaller national budgets, most of these countries are forced to be especially selective in their military purchases. As a consequence, few major weapon systems purchases are likely to be made in either region. The value of all arms transfer agreements with developing nations in 2015 was $65.2 billion, a substantial decrease from the $79.3 billion total in 2014 (Figure 1) (Table 1) (Table 3) (Table 4). In 2015, the value of all arms deliveries to developing nations ($33.6 billion) decreased slightly from the value of 2014 deliveries ($36.2 billion). 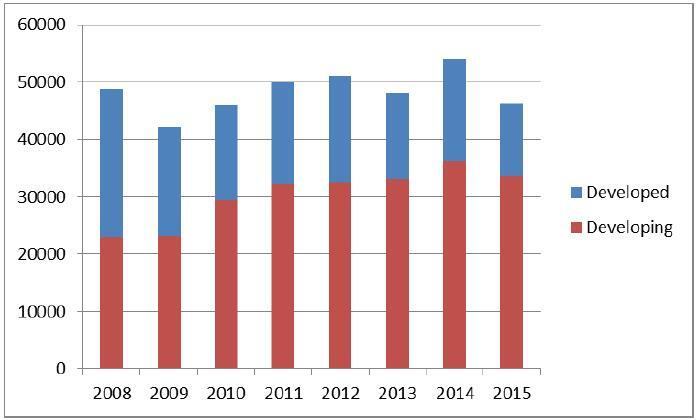 Deliveries since 2008 peaked in 2014 (Figure 7 and Figure 8) (Table 2) (Table 15). Until France ranked second in 2015, the United States and Russia had dominated the arms market in the developing world since 2012. Both nations either ranked first or second among countries for three out of the four years in terms of the value of arms transfer agreements. From 2012 to 2015, the United States made approximately $85.6 billion of these agreements, or 33.38%. During this same period, Russia made $48.6 billion, 18.9% of all such agreements, expressed in current dollars. Collectively, the United States and Russia made 52.33%, just over half of all arms transfer agreements with developing nations during this four-year period. France from 2012 to 2015 made nearly $27.7 billion or 10.8% of all such agreements with developing nations during these years. In the earlier period (2008-2011) Russia ranked second with $32.8 billion in arms transfer agreements with developing nations or 15.3%; the United States made $111.1 billion in arms transfer agreements during this period or 51.8%. France made $21.5 billion in agreements or 10% (Table 3). In any given year for the period 2008-2015, most arms transfers to developing nations were made by two or three major suppliers. The United States ranked first among these suppliers for all but one year during this period. Russia has been a competitor for the lead in arms transfer agreements with developing nations, ranking first in 2009, and second every year since except 2015. Although Russia has lacked the larger traditional client base for armaments held by the United States and the major West European suppliers, it has been a major source of weaponry for a few key purchasers in the developing world. Russia's most significant high-value arms transfer agreements continue to be with India. Russia has also had some success in concluding arms agreements with clients in the Near East and Southeast Asia. Russia has increased its sales efforts in Latin America with a principal focus on Venezuela. Russia has adopted more flexible payment arrangements, including loans, for its prospective customers in the developing world generally, including a willingness in specific cases to forgive outstanding debts owed to it by a prospective client in order to secure new arms purchases. At the same time Russia continues efforts to enhance the quality of its follow-on support services to make Russian weaponry more attractive and competitive, attempting to assure potential clients that it will provide timely and effective service and spare parts for the weapon systems it sells. Among the four major West European arms suppliers, France and the United Kingdom have been the most successful in concluding significant orders with developing countries from 2008 to 2015, based on either long-term supply relationships or their having specialized weapon systems available for sale. Germany, however, has shown particular success in selling naval systems customized for developing nations. The United Kingdom has had comparable successes with aircraft sales. Despite the competition the United States faces from other major arms suppliers, it appears likely it will hold its position as the principal supplier to key developing world nations, especially with those able to afford major new weapons. From the onset of the Cold War period, the United States developed an especially large and diverse base of arms equipment clients globally with whom it is able to conclude a continuing series of arms agreements annually. For decades it has also provided upgrades, spare parts, ordnance and support services for the wide variety of weapon systems it has previously sold to this large list of clients. This provides a steady stream of orders from year to year, even when the United States does not conclude major new arms agreements for major weapon systems. It also makes the United States a logical supplier for newer- generation military equipment to these traditional purchasers. Major arms-supplying nations continue to center their sales efforts on the wealthier developing countries, as arms transfers to the less-affluent developing nations remain constrained by the scarcity of funds in their defense budgets and the unsettled state of the international economy. From 2008 to 2011, the values of all arms transfer agreements with developing nations increased from year to year, but declined in 2010. These agreements reached a peak in 2011 at about $78 billion. The increase in agreements with developing nations from 2008 to 2012, and particularly in 2011, was driven to an important degree by sales to the more affluent developing nations, especially key oil-producing states in the Persian Gulf, which actively sought new advanced weaponry during these years, as part of a U.S. effort to enhance the militaries of its key partners there. More recently, the less-traditional European and non-European suppliers, including China, have been successful in securing some agreements with developing nations, although at lower levels and with uneven results, compared to the major weapons suppliers. Yet, these non-major arms suppliers have occasionally made arms deals of significance, such as missile sales and light combat systems. In 2014, Canada won a contract with Saudi Arabia to sell 108 armored vehicles, for a total of approximately $14 billion. After ending a decades-long arms agreement with Saudi Arabia, in 2015, Sweden found a buyer in the U.A.E. for two new Erieye airborne Swing Role Surveillance Systems and the upgrade of two others for a total of $1.27 billion. Although their agreement values appear larger when they are aggregated as a group, most of their annual arms transfer agreement values during 2008-2015 have been comparatively low when they are listed as individual suppliers. In various cases, these suppliers have been successful in selling older generation or less-advanced equipment. This group of arms suppliers is more likely to be the source of small arms and light weapons and associated ordnance rather than routine sellers of major weapon systems. Most of these arms suppliers do not rank very high in the value of their arms agreements and deliveries, although some will rank among the top 10 suppliers from year to year (Table 43, Table 9, Table 10, Table 15, Table 20 , and Table 21). The total value of United States arms transfer agreements with developing nations registered a decrease from $29.7 billion in 2014 to $26.7 billion in 2015. Even so, the U.S. market share of the value of all such agreements was 40.99% in 2015, an increase from a 37.48% share in 2014 (Figure 1, Figure 7, and Figure 8) (Table 1, Table 3, Table 4, and Table 5). In 2015, the total value of U.S. arms transfer agreements with developing nations was comprised primarily of major new orders in the Near East and Asia. The U.S. reached key agreements with Saudi Arabia and Iraq in the Near East and South Korea in Asia. The United States also continued to secure orders for significant equipment and support services contracts with a broad number of U.S. clients globally. The approximately $40 billion arms agreement total for the United States in 2015 also reflects the continuing U.S. advantage of having well-established defense support arrangements with many weapons purchasers worldwide, based upon the existing U.S. weapon systems that the militaries of these clients utilize. U.S. agreements with all of its customers in 2015 include not only sales of very costly major weapon systems, but also the upgrading and the support of systems previously provided. It is important to emphasize that U.S. arms agreements involving a wide variety of items such as spare parts, ammunition, ordnance, training, and support services can have significant costs associated with them. The larger valued arms transfer agreements with the United States in 2015 with developing nations included multiple agreements with Saudi Arabia to provide, among other things, munitions and associated accessories and Patriot PAC-3 missiles for over $7 billion. Purchases from Qatar reached $9.9 billion for calendar year 2015. In the fourth quarter of fiscal year 2014, Qatar accepted the cases that make up the majority of this value, with contracts for Patriot missiles, Javelin missiles, and Apache helicopters worth $9.56 billion, although it was reported in the press that Secretary of Defense Hagel signed an agreement with Qatar in July of 2014 worth $11 billion. South Korea's orders totaled nearly $5 billion, including, among other things, contracts for a RF-16 aircraft upgrade program and Aegis Shipboard Combat System. The total value of Russia's arms transfer agreements with developing nations in 2015 was $11 billion, an increase from $10.2 billion in 2014. Russia's share of all developing world arms transfer agreements also increased from 12.9% in 2014 to 16.9% in 2015 (Figure 1, Figure 7, and Figure 8) (Table 1, Table 3, Table 4, Table 5, and Table 10). 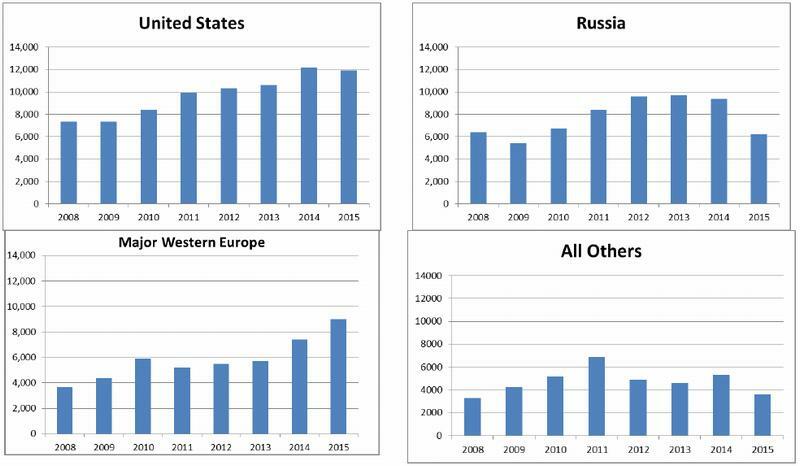 Russia's arms transfer agreement totals with developing nations have been notable during the eight years covered in this report, reaching a peak in 2012 of $16.7 billion (in current dollars). During the 2012-2015 period, Russia ranked second among all suppliers to developing countries, making nearly $49 billion in agreements (in current dollars) (Table 9). Russia's status as a leading supplier of arms to developing nations reflects a successful effort to overcome the significant industrial production problems associated with the dissolution of the former Soviet Union. The major arms clients of the former Soviet Union were generally less wealthy developing countries. In the Soviet era, several client states received substantial military aid grants and significant discounts on their arms purchases. Confronted with a limited arms client base in the post-Cold War era and stiff competition from Western arms suppliers for new markets, Russia adapted its selling practices in the developing world in an effort to regain and sustain an important share among previous and prospective clients in that segment of the international arms market. In recent years, Russia has made significant efforts to provide more creative financing and payment options for prospective arms purchasers. Russia has agreed to engage in counter-trade, offsets, debt-swapping, and, in key cases, to make significant licensed production agreements in order to sell its weapons. Russia's willingness to agree to licensed production has been a critical element in several cases involving important arms clients, particularly India and China. Russia's efforts to expand its arms customer base elsewhere have met with mixed results. Some successful Russian arms sales efforts have occurred in Southeast Asia. Here Russia has signed arms agreements with Malaysia, Vietnam, Burma, and Indonesia. Russia has also concluded major arms deals with Venezuela and Algeria. Elsewhere in the developing world, Russian military equipment continues to be competitive because it ranges from the most basic to the highly advanced. Russia's less expensive armaments have proven attractive to less affluent developing nations. Missiles and aircraft continue to provide a significant portion of Russia's arms exports, less so naval systems. Nevertheless, the absence of substantial funding for new research and development efforts in these and other military equipment areas has hampered Russia's longer-term foreign arms sales prospects. Weapons research and development (R&D) programs exist in Russia, yet other major arms suppliers have advanced much more rapidly in developing and producing weaponry than have existing Russian military R&D programs, a factor that may deter expansion of the Russian arms client base. This was illustrated by Russia's decision to acquire French technology through purchase of the Mistral amphibious assault ship, rather than relying on Russian shipbuilding specialists to create a comparable ship for the Russian Navy. However in August 2015, France canceled the Mistral agreement. A key Russian arms client in Asia has been China, |2| which purchased advanced aircraft and naval systems. Since 1996, Russia has sold China Su-27 fighter aircraft and agreed to their licensed production. It has sold the Chinese quantities of Su-30 multi-role fighter aircraft, Sovremenny-class destroyers equipped with Sunburn anti-ship missiles, and Kilo-class Project 636 diesel submarines. Russia has also sold the Chinese a variety of other weapon systems and missiles. Chinese arms acquisitions seem aimed at enhancing its military projection capabilities in Asia, and its ability to influence events throughout the region. One policy concern is to ensure that the U.S. provides appropriate military equipment to allies and friendly states in Asia to help offset any prospective threat China may pose to such nations. |3| The Chinese military has been focused on absorbing and integrating into its force structure the significant weapon systems previously obtained from Russia, and there has also been tension between Russia and China over China's apparent practice of reverse engineering and copying major combat systems obtained from Russia, in violation of their licensed production agreements. In 2015, Russian arms agreements with developing nations included a renewed contract with Iran to deliver S-300 long-range air defense systems. The original contract was canceled by Russia in 2010 under pressure from the United States and Israel. India agreed to procure at least 200 Ka-226 helicopters worth up to $1 billion, and Algeria is to purchase 14 Sukhoi Su-30MKI fighter jets. Russia and China signed an agreement in 2015 in which China would purchase 24 Sukhoi Su-35 fighter jets, valued at more than $2 billion. This agreement makes China the first foreign buyer of the Su-35. After lifting its arms embargo in 2014, Russia signed an agreement with Pakistan for four MI-35 attack helicopters. This sale marks a shift in Russian foreign policy towards Pakistan. It was not until the Iran-Iraq war in the 1980s that China became an important arms supplier, one willing and able to provide weaponry when other major suppliers withheld sales to both belligerents. During that conflict, China demonstrated that it was willing to provide arms to both combatants in quantity and without conditions. Subsequently, China's arms sales have been more regional and targeted in the developing world. From 2012 to 2015, the value of China's arms transfer agreements with developing nations has averaged over $4 billion annually. During the period of this report, the value of China's arms transfer agreements with developing nations was highest in 2015 at $6 billion (in current dollars). China's arms agreements total in 2014 was $3.3 billion. China's totals can be attributed, in part, to continuing contracts with Pakistan, a key historic client. More broadly, China's sales figures reflect several smaller valued weapons deals in Asia, Africa, and the Near East, rather than especially large agreements for major weapon systems (Table 43, Table 10, and Table 11) (Figure 7). Comparatively, few developing nations with significant financial resources have purchased Chinese military equipment during the eight-year period of this report. Most Chinese weapons for export are less advanced and sophisticated than weaponry available from Western suppliers or Russia. China, consequently, does not appear likely to be a key supplier of major conventional weapons in the developing world arms market in the immediate future. That said, China has indicated that increasingly it views foreign arms sales as an important market in which it wishes to compete, and has increased the promotion of its more advanced aircraft in an effort to secure contracts from developing countries. China's weapon systems for export seem based upon designs obtained from Russia through previous licensed production programs. Nonetheless, China's likely client base will be states in Asia and Africa seeking quantities of small arms and light weapons, rather than major combat systems. China continues to be the source of a variety of small arms and light weapons transferred to African states. The prospects for significant revenue earnings from these arms sales are limited. China likely views such sales as one means of enhancing its status as an international political power, and increasing its ability to obtain access to significant natural resources, especially oil. The control of sales of small arms and light weapons to regions of conflict, especially to some African nations, has been a matter of concern to the United States and others. The United Nations also has undertaken an examination of this issue in an effort to achieve consensus on a path to curtail this weapons trade comprehensively. During July 2012, the United Nations attempted to reach agreement on the text of an Arms Trade Treaty (ATT), aimed at setting agreed standards for member states regarding what types of conventional arms sales should be made internationally, and what criteria should be applied in making arms transfer decisions. At the end of the month-long period, set aside for negotiations, this effort failed to achieve the necessary consensus on a treaty draft. China, while not a member of the group of U.N. states negotiating the final draft, made it publicly clear that it did not support any treaty that would prevent any state from making its own, independent, national decision to make an arms sale. |5| The U.N. adopted the treaty as a resolution following a vote on April 2, 2013; China and Russia abstained. The treaty entered into force on December 24, 2014. To date, 78 states have ratified the treaty, with the United States as a signatory. President Obama transmitted the treaty to the Senate for its advice and consent on December 9, 2016. France, the United Kingdom, Germany, and Italy–the four major West European arms suppliers–have supplied a wide variety of sophisticated weapons to a number of purchasers. They are potential sources of armaments for nations that the United States chooses not to supply for policy reasons. The United Kingdom, for example, sold major combat fighter aircraft to Saudi Arabia in the mid-1980s, when the United States chose not to sell a comparable aircraft. More recently, India made European aircraft suppliers finalists in its competition for a major sale of combat aircraft– a competition ultimately won by France. The contending U.S. and Russian aircraft were rejected. France also contracted with the Egyptian navy for frigates valued at approximately $1.4 billion. Moreover, Saudi Arabia recently purchased 72 Eurofighter Typhoon fighter aircraft from the United Kingdom, an aircraft built by four European nations–the U.K, Germany, Italy and Spain. During the Cold War, NATO allies of the United States generally supported the U.S. position in restricting arms sales to certain nations. In the post-Cold War period, however, their national defense export policies have not been fully coordinated with the United States. The four major West European suppliers (France, the United Kingdom, Germany, and Italy), as a group, registered a significant increase in in their collective share of all arms transfer agreements with developing nations between 2014 and 2015, with France representing the majority. This group's share rose from 9.5% in 2014 to 27% in 2015. The collective value of this group's arms transfer agreements with developing nations in 2015 was $17.6 billion compared to a total of nearly $7.5 billion in 2014 (in current dollars). Of these four nations, France was the leading supplier with a record $15.2 billion in agreements in 2015. Italy, meanwhile registered $1 billion in arms agreements in 2015. (Figure 7 and Figure 8) (Table 3 and Table 5). In the period from 2008 to 2015, the four major West European suppliers were important participants in the developing world arms market. Individual suppliers within the major West European group have had notable years for arms agreements during this period: France in 2015 ($15.2 billion) and in 2009 ($9.3 billion); the United Kingdom in 2012 ($5.7 billion); Germany ($7 billion) in 2013, and in 2012 ($4.9 billion); and Italy in 2012 ($1.5 billion). In the case of all of these West European nations, large agreement totals in one year have usually resulted from the conclusion of large arms contracts with one or a small number of major purchasers in that particular year (Table 3 and Table 5). The major West European suppliers, individually, have enhanced their competitive position in weapons exports through strong government marketing support for their foreign arms sales. All of them can produce both advanced and basic air, ground, and naval weapon systems. The four major West European suppliers have sometimes competed successfully for arms sales contracts with developing nations against the United States, which has tended to sell to several of the same major clients, especially to the Persian Gulf states that see the United States as the ultimate guarantor of Gulf security. The continuing demand for U.S. weapons in the global arms marketplace, from a large established client base, has created a more difficult environment for individual West European suppliers to secure large new contracts with developing nations on a sustained basis. Yet, as the data indicate, the major West European suppliers continue to make significant arms transfer contracts each year. In 2015, a contract with Qatar for the Rafale fighter jet and missiles for a value of $7.1 billion contributed to France's record-setting export total, along with a contract with Egypt for two dozen Rafale fighter jets and a naval frigate worth nearly $6 billion. The leading markets for arms in regions of the developing world have been predominately in the Near East and Asia. Latin American and African nations, by contrast, have not been major purchasers of weapons, with rare exceptions. The regional arms agreement data tables in this report demonstrate this. U.S. policymakers have placed emphasis on helping to maintain stability throughout the regions of the developing world. Consequently, the United States has made and supported arms sales and transfers it has argued would advance that goal, while discouraging significant sales by other suppliers to states and regions where military threats to nations in the area are minimal. Other arms suppliers do not necessarily share the U.S. perspective on what constitutes an appropriate arms sale, and in some instances the financial benefit of the sale to the supplier overrides other considerations. The regional and country specific arms-transfer data in this report provide an indication of where various arms suppliers are focusing their attention and who their principal clients are. By reviewing these data, policymakers can identify potential developments that may be of concern, and use this information to assist a review of options they may choose to consider, given the circumstances. What follows below is a review of data on arms-transfer agreement activities in the two regions that lead in arms acquisitions, the Near East and Asia. This is followed, in turn, by a review of data regarding the leading arms purchasers in the developing world more broadly. The Persian Gulf crisis of August 1990-February 1991 was a principal catalyst for major new weapons purchases in the Near East made during the last twenty-five years. This crisis, culminating in a U.S.-led war to expel Iraq from Kuwait, firmly established the United States as a guarantor of Gulf security and created new demands by key purchasers such as Saudi Arabia, Kuwait, the United Arab Emirates, and other members of the Gulf Cooperation Council (GCC) for a variety of advanced weapon systems. Subsequently, concerns over the growing strategic threat from Iran, which have continued into the 21st century, have become the principal basis of GCC states' advanced arms purchases. Because GCC states do not share a land border with Iran, their weapons purchases have focused primarily on air, naval, and missile defense systems. Egypt and Israel have also continued their military modernization programs by increasing their purchases of advanced weaponry, primarily from the United States. From 2008-2011, Saudi Arabia was the largest purchaser with an agreements value of $52.5 billion. In 2012-2015 Saudi Arabia again held the largest number of agreements with a total value of $41 billion (in current dollars). India was again second with $23.9 billion (Table 11 and Table 12). The Near East has generally been the largest arms market in the developing world. In the earlier period (2008-2011), it ranked first with 54.47% of the total value of all developing nations arms transfer agreements ($115 billion in current dollars). The Asia region ranked second in 2008-2011 with 28.85% of these agreements ($61 billion in current dollars). During 2012-2015, the Near East region again placed first with 61.11% of all developing nations agreements ($156.2 billion in current dollars). The Asia region ranked second in 2012-2015 with $72.2 billion of these agreements or 31.33% (Table 6 and Table 7). The United States was predominant in arms transfer agreements with the Near East during the 2008-2011 period with 75.08% of their total value ($86.4 billion in current dollars). Russia was distant second during these years with 5.47% ($6.3 billion in current dollars). Recently, from 2012 to 2015, the United States ranked first in arms agreements with this region with $54.6 billion (in current dollars), a 35% share. Russia accounted for 17.87% of the region's agreements in the most recent period ($27.9 billion in current dollars) (Figure 5) (Table 6 and Table 8). The data on regional arms-transfer agreements from 2008 to 2015 indicate that Asia, after the Near East, is the second largest region of the developing world for orders of conventional weaponry. Throughout Asia, several developing nations have been upgrading and modernizing their defense forces, and this has led to new conventional weapons sales in that region. Beginning in the mid-1990s, Russia became the principal supplier of advanced conventional weaponry to China for about a decade–selling it fighters, submarines, destroyers, and missiles–while establishing itself as the principal arms supplier to India. Russian arms sales to these two countries have been primarily responsible for much of the increase in Asia's overall share of the arms market in the developing world during much of the period of this report. Russia has also expanded its client base in Asia, securing aircraft orders from Malaysia, Vietnam, Burma, and Indonesia. It is notable that India, while the principal Russian arms customer, during recent years has sought to diversify its weapons supplier base, purchasing the Phalcon early warning defense system aircraft in 2004 from Israel and numerous items from France in 2005, in particular six Scorpene diesel attack submarines. In 2008 India purchased six C130J cargo aircraft from the United States. In 2010, the United Kingdom sold India 57 Hawk jet trainers for $1 billion. In 2010 Italy also sold India 12 AW101 helicopters. In 2011, France secured a $2.4 billion contract with India to upgrade 51 of its Mirage-2000 combat fighters, and the United States agreed to sell India 10 C-17 Globemaster III aircraft for $4.1 billion. This pattern of Indian arms purchases indicates that Russia will likely face strong new competition from other major weapons suppliers for the India arms market, and it can no longer be assured that India will consistently purchase its major combat systems. Indeed, India in 2011 had eliminated Russia from the international competition to supply a new-generation combat fighter aircraft, a competition won by France. In 2015 Russia and India agreed to a contract in which India would procure at least 200 Ka-226T helicopters. Asia has over time been the second-largest developing-world arms market. In 2012-2015, Asia ranked second, accounting for 31.3% of the total value of all arms transfer agreements with developing nations ($72.2 billion in current dollars). In the earlier period, 2008-2011, the Asia region ranked second, accounting for 28.8% of all such agreements ($61 billion in current dollars) (Table 6 and Table 7). In the earlier period (2008-2011), the United States ranked first in the value of arms transfer agreements with Asia with 27.53% ($16.8 billion in current dollars).Russia made 26.23% of this region's agreements in 2008-2011. The major Western European suppliers, as a group, made 17% of this region's agreements. In the later period (2012-2015), the United States ranked first in Asian agreements with 36.53% ($26.4 billion in current dollars); Russia ranked second with 24.53% ($17.7 billion in current dollars). The major West European suppliers, as a group, made 16.9% of this region's agreements in 2012-2015. (Figure 6) (Table 8). Saudi Arabia was the leading developing world arms purchaser from 2008-2015, with agreements totaling $93.5 billion. India was the second largest developing world arms purchaser from 2008 to 2015, making arms transfer agreements totaling $34 billion during these years (in current dollars). These increases reflect the military modernization efforts by India, underway since the 1990s. In the 2008-2011 period, Saudi Arabia ranked first in arms transfer agreements at $52.5 billion (in current dollars). In 2012-2015 Saudi Arabia ranked first in arms transfer agreements, with $41 (in current dollars). The total value of all arms transfer agreements with developing nations from 2008 to 2015 was $468.4 billion (in current dollars). (Table 3, Table 6, Table 12, and Table 13). Regional weapons delivery data reflect the diverse sources of supply and type of conventional weaponry actually transferred to developing nations. Even though the United States, Russia, and the four major West European suppliers dominate in the delivery of the 14 classes of weapons examined, it is also evident that the other European suppliers and some non-European suppliers, including China, can be leading suppliers of selected types of conventional armaments to developing nations (Tables 25-29). These data indicate that substantial quantities of major combat systems were delivered to the Near East region from 2012-2015, in particular, tanks and self-propelled guns, armored vehicles, supersonic combat aircraft, helicopters, air defense and anti-ship missiles. Although the United States, Russia, and the European suppliers were the ones who delivered the greater number of these significant combat systems, other suppliers provided important naval systems and ground equipment as well. Both aircraft platforms and naval craft are particularly expensive, and constitute a large portion of the dollar values of arms deliveries of all suppliers to this region during the 2012-2015 period. Although not necessarily as expensive as aircraft or naval vessels, other weapon systems possess significant capabilities and create important security threats in the Near East region. Such systems include anti-ship and surface-to-surface missiles. In these categories Russia delivered 60 surface-to-surface missiles to the Near East from 2012-2015. The four major West European suppliers collectively delivered 170 anti-ship missiles. United States commercially licensed arms export deliveries data are not included in this report. The United States is the only major arms supplier that has two distinct systems for the export of weapons: the government-to-government Foreign Military Sales (FMS) system, and the licensed commercial export system. It should be noted that data maintained on U.S. commercial sales agreements and deliveries are incomplete, and are not collected or revised on an ongoing basis, making them significantly less precise than those for the U.S. FMS program–which accounts for the overwhelming portion of U.S. conventional arms transfer agreements and deliveries involving weapon systems. There are no official compilations of commercial agreement data comparable to that for the FMS program maintained on an annual basis. Once an exporter receives from the State Department a commercial license authorization to sell–valid for four years–there is no current requirement that the exporter provide to the State Department, on a systematic and ongoing basis, comprehensive details regarding any sales contract that results from the license authorization, including if any such contract is reduced in scope or cancelled. Nor is the exporter required to report that no contract with the prospective buyer resulted. Annual commercially licensed arms deliveries data are obtained from shipper's export documents and completed licenses from ports of exit by the U.S. Customs and Border Protection Agency which are then provided to the U.S. Census Bureau. The Census Bureau takes these arms export data, and, following a minimal review of them, submits them to the Directorate of Defense Trade Controls in the Political-Military Bureau (PM/DDTC) of the State Department, which makes the final compilation of such data–details of which are not publicly available. Once compiled by the Directorate of Defense Trade Controls at the State Department, these commercially licensed arms deliveries data are not revised. By contrast, the U.S. Foreign Military Sales (FMS) program data, for both agreements and deliveries, maintained by the Defense Department, are systematically collected, reviewed for accuracy on an ongoing basis, and are revised from year-to-year as needed to reflect any changes or to correct any errors in the information. This report includes all FMS deliveries data. By excluding U.S. commercial licensed arms deliveries data, the U.S. arms delivery totals will be understated. Some have suggested that a systematic data collection and reporting system for commercial licensed exports, comparable to the one that exists now in the Department of Defense, should be established by the Department of State. Having current and comprehensive agreement and delivery data on commercially licensed exports would provide a more complete picture of the U.S. arms export trade, in this view, and thus facilitate Congressional oversight of this sector of U.S. exports. Tables 3 through 13 present current official data on arms transfer agreements with developing nations by major suppliers from 2008 to 2015. These data show the most recent trends in arms contract activity by major suppliers. Delivery data, which reflect implementation of sales previously concluded, are provided in Tables 14 through 24. Table 30, Table 31, Table 32, Table 33, and Table 34 provide data on worldwide arms transfer agreements from 2008-2015, while Table 35, Table 36, Table 37, Table 38, and Table 39 provide data on worldwide arms deliveries during this period. To use these data regarding agreements for purposes other than assessing general trends in seller/buyer activity is to risk drawing conclusions that can be readily invalidated by future events–precise values and comparisons, for example, may change due to cancellations or modifications of major arms transfer agreements previously concluded. These data sets reflect the comparative magnitude of arms transactions by arms suppliers with recipient nations expressed in constant dollar terms, unless otherwise noted. Illustrative pie and bar charts are provided in this section to give the relative market share of individual arms suppliers globally, to the developing world and to specific regions. Table 1 provides the value of worldwide arms transfer agreements for 2008-2011. 2012-2015 and 2015, and the suppliers'share of such agreements with the developing world. Table 2 provides the value of worldwide arms deliveries for 2008-2011, 2012-2015 and 2015, and the suppliers'share of such deliveries with the developing world. Specific content of other individual data tables is described below. Table 3 shows the annual current dollar values of arms transfer agreements to developing nations by major suppliers from 2008-2015. This table provides the data from which Table 4 (constant dollars) and Table 5 (supplier percentages) are derived. Table 6 gives the values of arms transfer agreements between suppliers and individual regions of the developing world for the periods 2008-2011 and 2012-2015. These values are expressed in current U.S. dollars. Table 7, derived from Table 6, gives the percentage distribution of each supplier's agreement values within the regions for the two time periods. Table 8, also derived from Table 6, illustrates what percentage share of each developing world region's total arms transfer agreements was held by specific suppliers during the years 2008-2011 and 2012-2015. Table 9 gives the values of arms transfer agreements with the developing nations from 2008 to 2015 by the top 11 suppliers. The table ranks these suppliers on the basis of the total current dollar values of their respective agreements with the developing world for each of three periods– 2008-2011, 2012-2015, and 2008-2015. Table 10 ranks and gives for 2015 the values of arms transfer agreements with developing nations of the top 11 suppliers in current U.S. dollars. Table 11 gives the values of arms transfer agreements with the Near East nations by suppliers or categories of suppliers for the periods 2008-2011 and 2012-2015. These values are expressed in current U.S. dollars. They are a subset of the data contained in Table 3 and Table 6. Table 12 gives the values of arms transfer agreements made by the top 10 recipients of arms in the developing world from 2008 to 2015 with all suppliers collectively. The table ranks recipients on the basis of the total current dollar values of their respective agreements with all suppliers for each of three periods–2008-2011, 2012-2015 and 2008-2015. Table 13 names the top 10 developing world recipients of arms transfer agreements in 2015. The table ranks these recipients on the basis of the total current dollar values of their respective agreements with all suppliers in 2015. Table 14 shows the annual current dollar values of arms deliveries (items actually transferred) to developing nations by major suppliers from 2008-2015. The utility of these particular data is that they reflect transfers that have occurred. They provide the data from which Table 15 (constant dollars) and Table 16 (supplier percentages) are derived. Table 17 gives the values of arms deliveries by suppliers to individual regions of the developing world for the periods 2008-2011 and 2012-2015. These values are expressed in current U.S. dollars. Table 18, derived from Table 17, gives the percentage distribution of each supplier's deliveries values within the regions for the two time periods. Table 19, also derived from Table 17, illustrates what percentage share of each developing world region's total arms delivery values was held by specific suppliers during the years 2008-2011 and 2012-2015. Table 20 gives the values of arms deliveries to developing nations from 2008-2015 by the top 11 suppliers. The table ranks these suppliers on the basis of the total current dollar values of their respective deliveries to the developing world for each of three periods–2008-2011, 2012-2015, and 2008-2015. Table 21 ranks and gives for 2015 the values of arms deliveries to developing nations of the top 11 suppliers in current U.S. dollars. Table 22 gives the values of arms delivered to Near East nations by suppliers or categories of suppliers for the periods 2008-2011 and 2012-2015. These values are expressed in current U.S. dollars. They are a subset of the data contained in Table 14 and Table 17. Table 23 gives the values of arms deliveries made to the top 10 recipients of arms in the developing world from 2008 to 2015 by all suppliers collectively. The table ranks recipients on the basis of the total current dollar values of their respective deliveries from all suppliers for each of three periods–2008-2011, 2012-2015 and 2008-2015. Table 24 names the top 10 developing world recipients of arms transfer agreements in 2015. The table ranks these recipients on the basis of the total current dollar values of their respective agreements with all suppliers in 2015. Notes: Developing nations category excludes the United States, Europe, Canada, Japan, Australia, and New Zealand. All data are for the calendar year given except for U.S. MAP (Military Assistance Program), IMET (International Military Education, and Training), and Excess Defense Article data, which are included for the particular fiscal year. All amounts given include the values of all categories of weapons, spare parts, construction, all associated services, military assistance, excess defense articles, and training programs. Statistics for foreign countries are based upon estimated selling prices. All foreign data are rounded to the nearest $100 million. a. Major West European category includes France, United Kingdom, Germany, and Italy. Notes: All foreign data rounded to the nearest $100 million. Notes: All foreign data are rounded to the nearest $100 million. Where rounded data totals are the same, the rank order is maintained. Notes: 0=data less than $50 million or nil. All data are rounded to the nearest $100 million. a. Major West European category includes France, United Kingdom, Germany, and Italy totals as an aggregate figure. Notes: All data are rounded to the nearest $100 million. Where rounded data totals are the same, the rank order is maintained. Note: Developing nations category excludes the United States, Europe, Canada, Japan, Australia, and New Zealand. All data are for the calendar year given except for U.S. MAP (Military Assistance Program), IMET (International Military Education, and Training), and Excess Defense Article data, which are included for the particular fiscal year. All amounts given include the values of all categories of weapons, spare parts, construction, all associated services, military assistance, excess defense articles, and training programs. Statistics for foreign countries are based upon estimated selling prices. All foreign data are rounded to the nearest $ 100 million. a. Based on Department of Defense Price Deflator. Note: All foreign data are rounded to the nearest $l00 million. Notes: All foreign data are rounded to the nearest $l00 million. Where rounded data totals are the same, the rank order is maintained. Note: All data are rounded to the nearest $l00 million. Where rounded data totals are the same, the rank order is maintained. Other useful data for assessing arms transfers are those that indicate who has actually delivered specific numbers of specific classes of military items to a region. These data are relatively "hard" in that they reflect actual transfers of military equipment. They have the limitation of not giving detailed information regarding either the sophistication or the specific name of the equipment delivered. However, these data show relative trends in the delivery of important classes of military equipment and indicate who the leading suppliers are from region to region over time. Data in the following tables set out actual deliveries of fourteen categories of weaponry to developing nations from 2008 to 2015 by the United States, Russia, China, the four major West European suppliers as a group, all other European suppliers as a group, and all other suppliers as a group. The tables show these deliveries data for all of the developing nations collectively, for Asia, for the Near East, for Latin America, and for Africa. Care should be taken in using the quantitative data within these specific tables. Aggregate data on weapons categories delivered by suppliers do not provide precise indices of the quality and/or quantity of the weaponry delivered. The history of recent conventional conflicts suggests that quality and/or sophistication of weapons can offset quantitative advantage. Further, these data do not provide an indication of the relative capabilities of the recipient nations to use effectively the weapons delivered to them. Superior training–coupled with good equipment, tactical and operational proficiency, and sound logistics–may, in the last analysis, be a more important factor in a nation's ability to engage successfully in conventional warfare than the size of its weapons inventory. Note: Developing nations category excludes the United States, Russia, Europe, Canada, Japan, Australia, and New Zealand. All data are for calendar years given. * Major West European includes France, United Kingdom, Germany, and Italy totals as an aggregate figure. Data relating to surface-to-surface and anti-ship missiles by foreign suppliers are estimates based on a variety of sources having a wide range of accuracy. As such, individual data entries in these two weapons delivery categories are not necessarily definitive. Notes: Developing nations category excludes the United States, Russia, Europe, Canada, Japan, Australia, and New Zealand. All data are for calendar years given. Data relating to surface-to-surface and anti-ship missiles by foreign suppliers are estimates based on a variety of sources having a wide range of accuracy. As such, individual data entries in these two weapons delivery categories are not necessarily definitive. a. Major West European includes France, United Kingdom, Germany, and Italy totals as an aggregate figure. Note: Developing nations category excludes the United States, Russia, Europe, Canada, Japan, Australia, and New Zealand. All data are for calendar years given. Data relating to surface-to-surface and anti-ship missiles by foreign suppliers are estimates based on a variety of sources having a wide range of accuracy. As such, individual data entries in these two weapons delivery categories are not necessarily definitive. Ten tables follow. Table 30, Table 31, Table 32, Table 35, Table 36, and Table 37 provide the total dollar values for arms transfer agreements and arms deliveries worldwide for the years 2008-2015. These tables use the same format and detail as Table 3, Table 4, Table 5, Table 14, Table 15, and Table 16, which provide the total dollar values for arms transfer agreements with and arms deliveries to developing nations. Table 33, Table 34, Table 38, and Table 39 provide a list of the top 11 arms suppliers to the world based on the total values (in current dollars) of their arms transfer agreements and arms deliveries worldwide during calendar years 2008-2011, 2012-2015, and 2011. These tables are set out in the same format and detail as Table 9 and Table 10 for arms transfer agreements with, and Table 21 for arms deliveries to developing nations, respectively. Total Worldwide Arms Transfer Agreements Values, 2008-2015. Table 30 shows the annual current dollar values of arms transfer agreements worldwide. Since these figures do not allow for the effects of inflation, they are, by themselves, of limited use. They provide, however, the data from which Table 31 (constant dollars) and Based on Department of Defense Price Deflator. Table 32 (supplier percentages) are derived from data in Table 31. Total Worldwide Delivery Values 2008-2015. Table 35 shows the annual current dollar values of arms deliveries (items actually transferred) worldwide by major suppliers from 2008-2015. The utility of these data is that they reflect transfers that have occurred. They provide the data from which Table 36 (constant dollars) and Based on Department of Defense Price Deflator. Table 37 (supplier percentages) are derived from data in Table 36. Note: All data are for the calendar year given, except for U.S. MAP (Military Assistance Program) and IMET (International Military Education and Training), excess defense articles, which are included for the particular fiscal year. All amounts given include the values of all categories of weapons and ammunition, military spare parts, military construction, excess defense articles, military assistance and training programs, and all associated services. Statistics for foreign countries are based upon estimated selling prices. All foreign data are rounded to the nearest $100 million. Note: Columns may not total due to rounding. Note: All data are for the calendar year given, except for U.S. MAP (Military Assistance Program) and IMET (International Military Education and Training), excess defense articles, which are included for the particular fiscal year. All amounts given include the values of all categories of weapons and ammunition, military spare parts, military construction, excess defense articles, military assistance and training programs, and all associated services. Statistics for foreign countries are based upon estimated selling prices. All foreign data are rounded to the nearest $l00 million. Tanks and Self-propelled Guns: This category includes light, medium, and heavy tanks; self-propelled artillery; self-propelled assault guns. Artillery: This category includes field and air defense artillery, mortars, rocket launchers and recoilless rifles–100 mm and over; FROG launchers–100mm and over. Armored Personnel Carriers (APCs) and Armored Cars: This category includes personnel carriers, armored and amphibious; armored infantry fighting vehicles; armored reconnaissance and command vehicles. Major Surface Combatants: This category includes aircraft carriers, cruisers, destroyers, frigates. Minor Surface Combatants: This category includes minesweepers, subchasers, motor torpedo boats, patrol craft, motor gunboats. Submarines: This category includes all submarines, including midget submarines. Guided Missile Patrol Boats: This category includes all boats in this class. Supersonic Combat Aircraft: This category includes all fighter and bomber aircraft designed to function operationally at speeds above Mach 1. Subsonic Combat Aircraft: This category includes all fighter and bomber aircraft designed to function operationally at speeds below Mach 1. Other Aircraft: This category includes all other fixed-wing aircraft, including trainers, transports, reconnaissance aircraft, and communications/utility aircraft. Helicopters: This category includes all helicopters, including combat and transport. Surface-to-air Missiles: This category includes all ground-based air defense missiles. Surface-to-surface Missiles: This category includes all surface-surface missiles without regard to range, such as Scuds and CSS-2s. It excludes all anti-tank missiles. It also excludes all anti-ship missiles, which are counted in a separate listing. Anti-ship Missiles: This category includes all missiles in this class such as the Harpoon, Silkworm, Styx, and Exocet. This document has been published on 28Dec16 by the Equipo Nizkor and Derechos Human Rights. In accordance with Title 17 U.S.C. Section 107, this material is distributed without profit to those who have expressed a prior interest in receiving the included information for research and educational purposes.